As a Froothie ambassador I get to try out some amazing pieces of kit. When I heard I would be getting the new Optimum P200 Dehydrator I was positively hopping up and down with excitement. Dehydrated foods are meant to be a good way of preserving fruit, veg and other foodstuffs whilst retaining flavour and nutritional content. There are many advantages to living in Cornwall, but dryness is not one of them and until now dehydrating foods has not been an option. The delivery day arrived and I was a bit concerned at the size of the box. The Optimum P200 Dehydrator is not small. I’d already figured there was no way it was going to fit in my kitchen, but it was too large for the spot I’d envisaged for it. Oh dear. In order to make space for it, we had a day of sorting, tidying and shifting things around, which was actually no bad thing. It now sits high and dry on a stack of boxes in an upstairs room. The fan from the Paralex drying system, which ensures even air distribution, is actually quite noisy, so you probably wouldn’t want it in the kitchen or any space where much time is spent. As long as we’re not in the room and the door is closed, however, we can’t hear it when it’s on. As soon as it was installed, a simple matter of sticking the plug in the socket, I was off down to our plot to pick nettles. Incidentally, it does need to live somewhere near a plug as extension leads are a no-no, apparently. My first experiment was a roaring success. Green powders, such as wheat grass, for adding nutrient content to things like smoothies can be very expensive. Nettles are high in all sorts of good things, so why not, I reasoned, make my own green powder. After seven hours, the nettles came out crisp and green and were easily turned into a powder in my Optimum 9200A power blender. Now all I need to do is go and pick some more. The accompanying user manual, I found, was not nearly as useful as it could have been. It gives the basics of how to use the timer, prepare foods prior to dehydration and a rough temperatures and timing guide for some foods. Inevitably, none of my chosen foods were included. ; I had to go online for much of the information I needed and get advice from friends. My burning question was, can you pull out a tray whilst the dehydrator is on, to check how things are going? Turns out you can, which is just as well as dehydration is not an exact science and how long items take to dry will depend on various factors, including how much moisture the items contain. Black isn’t a colour I would necessarily have chosen, but as foods are light sensitive, it’s imperative the dehydrator is dark to stop nutrients degrading and colour leaching out. Fair enough. The digital timer is great, as you can set it for as many hours and minutes as you like up to 40 hours. The thermostat can also be set to various temperatures from 35℃ to 68℃. My Optimum P200 Dehydrator has six trays, but a ten tray model is also available. The trays are quite roomy, measuring 34.5cm x 4.5cm x 37cm. I haven’t yet managed to fill all six of them, so I think this six-tray model will do for now. The trays are light to carry, easy to clean and are also dishwasher safe, if that’s your bag. I’m quite keen on trying to make fruit leather. A friend had a go once, but as she didn’t have a dehydrator, it was very soft and very sticky. The Optimum P200 Dehydrator comes with two non-stick sheets for this very purpose. It also includes two mesh sheets for finer material or for keeping leaves flat. I tried using one on top of my nettle leaves in one tray; it worked well and they all came out nicely flat. Not of course, that flat leaves mattered in this instance as they were all going to be blitzed into a powder. My second trial didn’t go quite so well, but dehydrating is a learning curve for me and I did learn some valuable lessons. Namely, do a bit of research before embarking on a project and dehydrating is probably best done in larger quantities. I bought a tub of blueberries, naively expecting them to dry down in just a few hours. After 20 hours at 52℃, I gave up. They were definitely getting there, but for only one half tray of blueberries, it just didn’t seem worth the cost of the electricity. I subsequently found out, that because of their waxy skins, they need to be pricked or cracked in boiling water first. If you’ve got a glut of blueberries and can fill all of the trays, it might be worth doing. In theory, you can prove bread and set yoghurt, but I haven’t worked out how this can be done yet and there were no instructions in the previously mentioned manual. Never mind, I have my next trial in mind and I’m pretty confident it’s going to be another roaring success. I can’t wait to get on with it. I don’t have experience of other dehydrators to compare the Optimum P200 to, but there are comparisons on the Froothie website along with a whole heap of other useful information, so it’s worth checking out. It comes with a three year warranty and at time of going to press is on offer at £199. It’s amazing and I’m no less excited now, than I was prior to it arriving. Trays are sturdy but light and slide in and out easily. If fully loaded, the cost of electricity is low, estimated at 6p an hour. CT is excited by my Optimum D200 Dehydrator too. He’s always concerned that he can’t get his seeds dry enough before packing them away for the winter. I shall have to watch him, or I can see him staging a coup. I’m a Froothie ambassador and this post contains affiliate links. Buying through a link will not cost you any more, but I will get a small commission. This helps keep Tin and Thyme blythe and blogging. Opinions are, as always, my own. What a great dehydrator. I bet it’s great and cheaper way to enjoy dried fruits instead of buying them. I’m not to sure it would be cheaper, unless you grow your own Jemma, but you know there are no preservatives, oil or added sugar which is a great benefit. I’m so intrigued by this – I’ve never tried dehydrating. I’m desperate to try raspberries. I love that you are still as excited by this as when it arrived. I’m still fizzing Helen, it will enable us to do lots of things we’ve wanted to do for years. Interesting. I’ve always been interested in trying a dehydrator, but I’m not sure I would use it enough to offset the cost. I think a small counter top one would be all I would need. I love that you made your own green powder though…genius! Thanks Jenn. Time will tell how much use we’ll make of it, but I’m suspecting it will be quite a bit. This looks so cool! My friend is about to buy a dehydrator so just sent him this link! I’d quite like to dry herbs properly as I always waste them when they wilt. Thanks! Thanks Lisa 🙂 It would be great for herbs. Like the nettles, it would be on the lowest setting and wouldn’t take too long – although I have yet to try them. I have heard a lot about dehydrators but have yet to try one. I’m interested in seeing how your future experiments turn out on the blog! Hopefully they will take your feedback on board and add some extra information with the manual, too. Oh, I do hope so Sarah, the manual was really quite disappointing. But I love the dehydrator – still really excited by the possibilities. Great idea to make green powder in it for smoothies – and especially a good idea to use nettles, as they’re so easy to come by! Yes and so nutritious too. Green powders are not cheap to buy. good to know, I was think a dehydrator was a good buy but I didn’t know the details about it. Good to read them here. Glad you found the review useful Paola. Dehydrators aren’t for everyone for sure, but I think it will get quite a bit of use here. A great piece of kit Choclette, with many, many uses! It’s such an exciting bit of kit isn’t it?! I’ve made fruit leather in mine successfully for the first time ever and the kids were SO impressed! Oh I bet they were impressed Chris, can’t wait to try fruit leather. Glad you’re excited too. My sis in law uses a dehydrator. I know I’d never get round to doing anything with one, but I can see the value for anyone who forages/wants to dry fruit and veg. 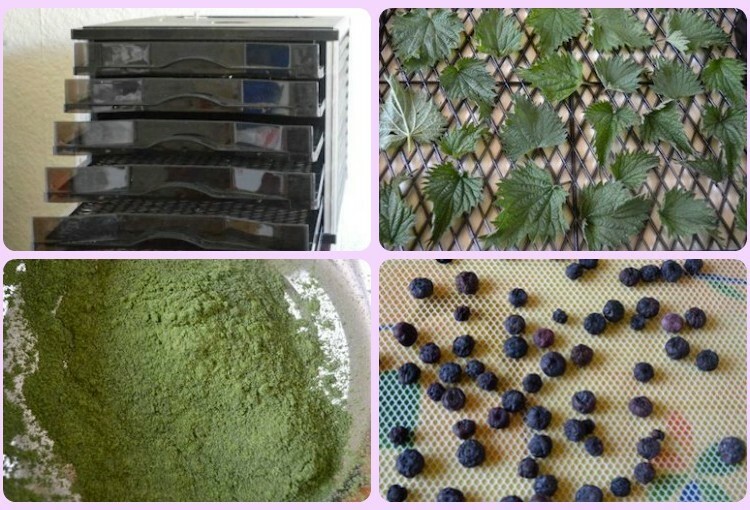 I love the idea of nettle powder, I bet you could make some great cosmetics? Hahaha Fiona, nettle eye shadow?If your sister in law has any tips, do pass them on. It’s amazing how much fun kit there is for foodies these days! I just reviewed a dehydrator and I rather liked it. It is useful to have one especially in the UK where drying food is difficult. I like your idea of drying nettle. I only tried with fruit and kale leaves, I might try with nettle next! Kale chips are on my list Alida, I’ve heard lots about them, but never tried them myself. i was wondering if you managed to work out yogurt and bread raising wit this machine? No, I never did get to grips with this. I think Froothie was going to provide a door so that it could be used for this purpose – i.e. with the trays taken out. But I’ve not chased them up to see if they made one.